How to build an elevated deck. You don’t want seven, eight, nine steps down. You want to build an elevated deck that you can put brick pavers on. Maintainance free, beautiful, resistant to the weather, and lasts forever. How to build an elevated deck. You want to go with an engineered deck plan that has oversize treated lumber. Everything has been built doubled up to hold the weight of the brick paver deck material. How to build an elevated deck. You oversize the footings. You oversize the posts. You oversize the beams and the joists. 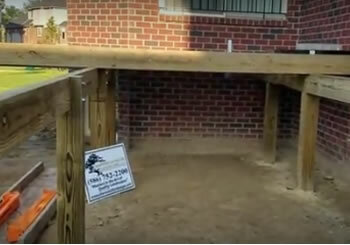 How to build an elevated deck and have brick pavers for your decking. For a free quote on an elevated deck in Shelby Township, Washington Township, Oakland Township, Township, give us a call at 586-752-2200.